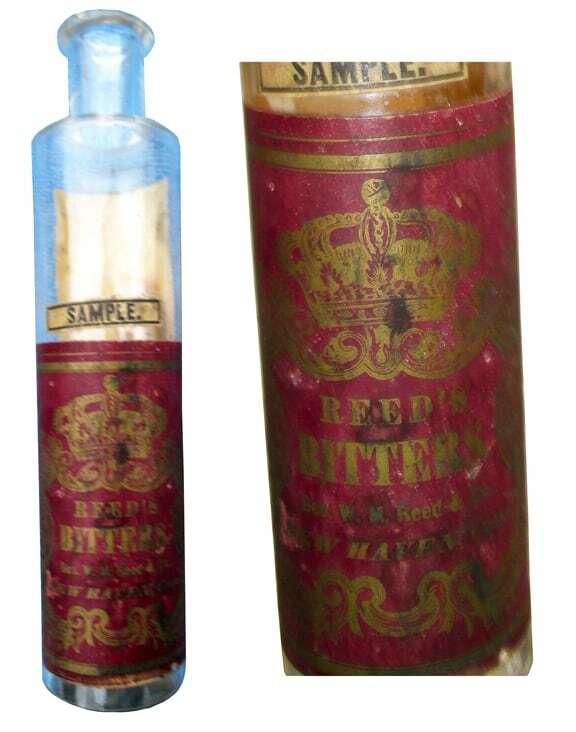 Incoming question about a Reed’s Bitters sample vial. I haven’t seen this before. 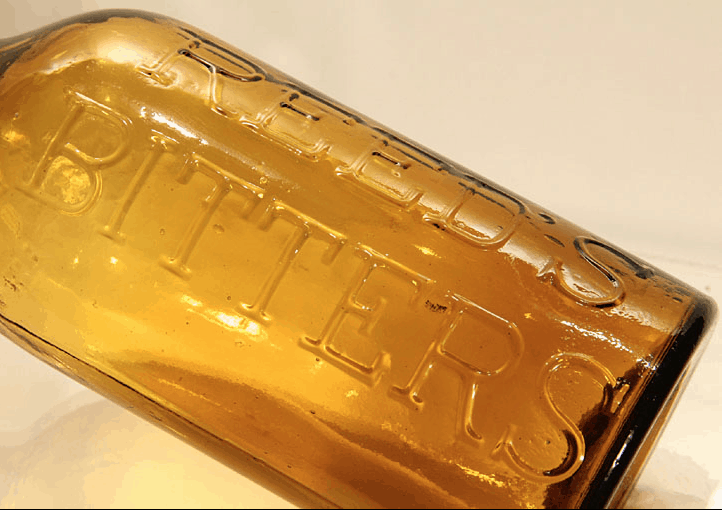 Most bitters collectors are familiar with Reed’s Bitters. We will use this opportunity to take a closer look. 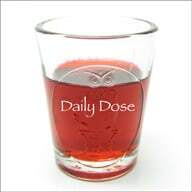 [PRG] John: Interesting little piece. 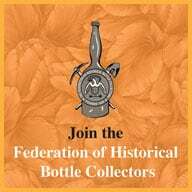 I don’t think I have ever seen a vial with a bitters label. 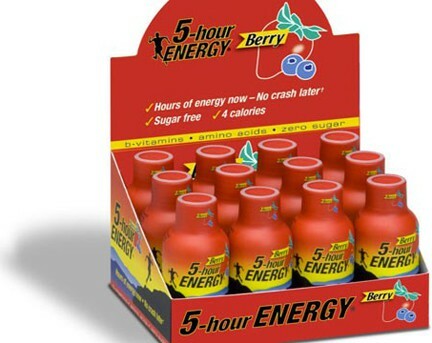 Maybe this was one of the first 5 Hour Energy Drinks you see on convenience store check-out counters. 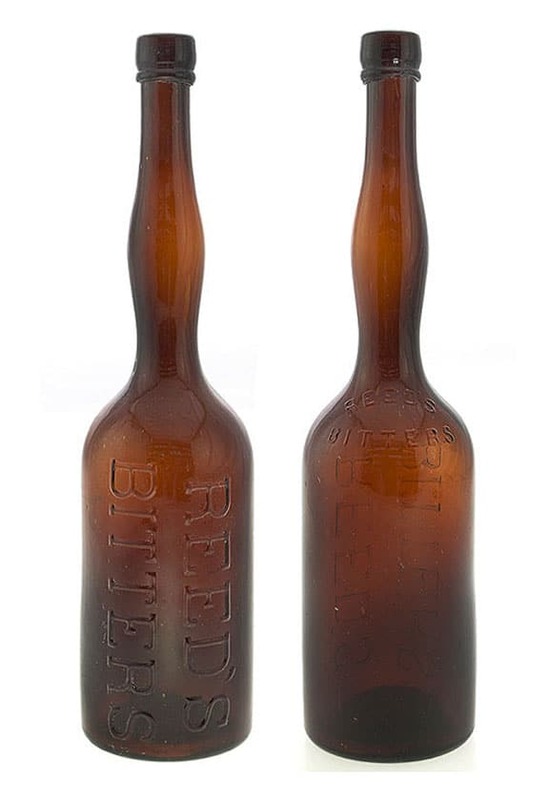 I do not see a listing in Ring and Ham Bitters Bottles but I do recognize a few key components on the label that tie right back to the Reed’s Bitters lady’s leg (see pictures below). 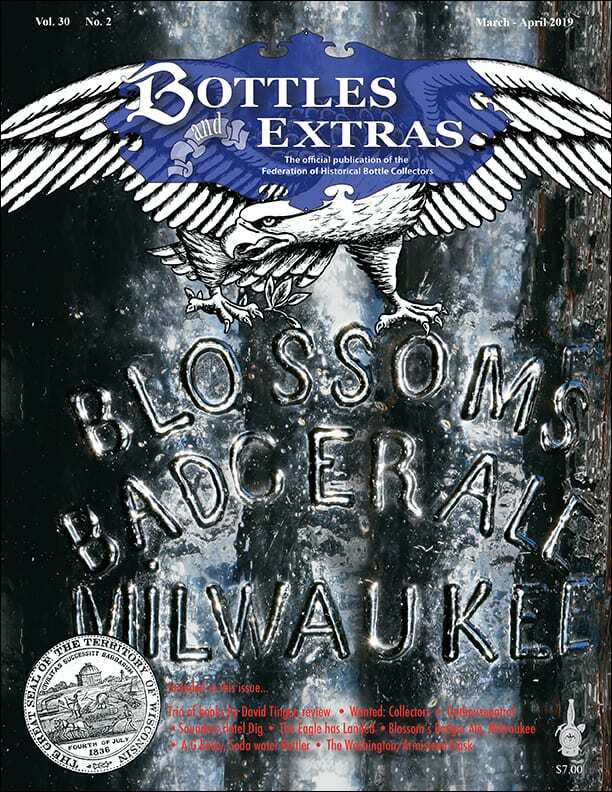 On the maroon label, beneath the serifed alphabet which is consistent with Reed’s Bitters typography, there looks to be a Geo. W. M. Reed, New Haven listing. This is consistent with the proprietor and later location of the brand. The testimonial on the back label is also really interesting as it looks like a real signature from George Reed in ink that has been smeared. 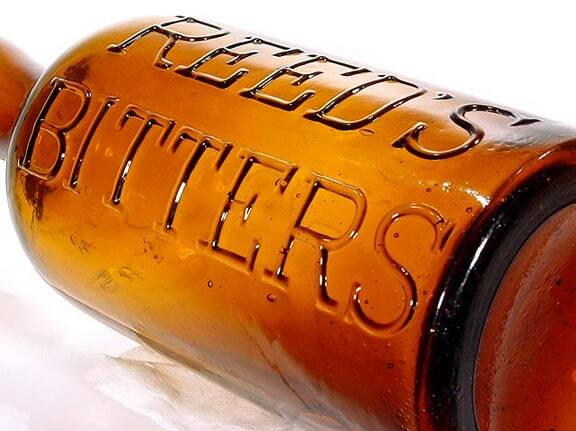 The word “Stomach” is positioned between “Reed’s” and “Bitters” which is interesting. 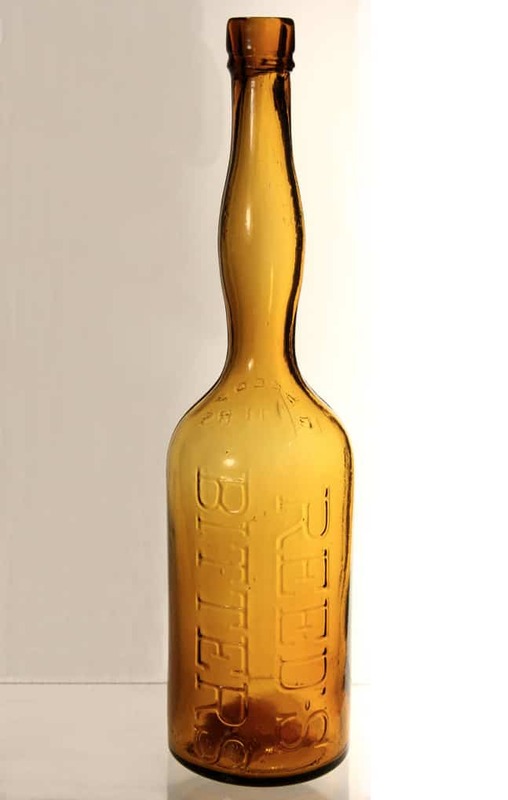 I have put together a few pictures of the parent Reed’s Bitters bottle, some collateral material and examples of the Reed’s Gilt Edge Tonic which was a popular beverage sold by Reed on a rather a large scale under dubious pretenses as you will see from court documents below. 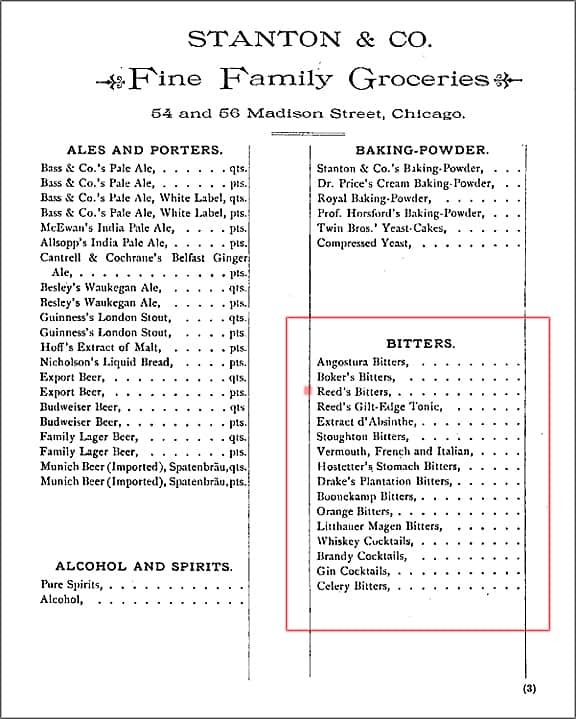 Notes: Directory listings show a W. Reed Distiller & Liquors, 27 Spring St., New York, in 1850. 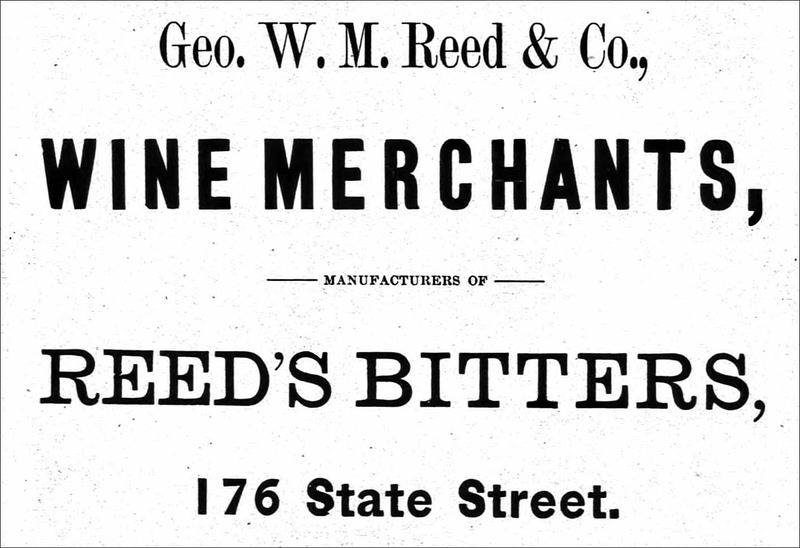 In 1880, W. Reed Liquors & Bitters, 18 Bleeker St., New York. Also listed is a Geo. 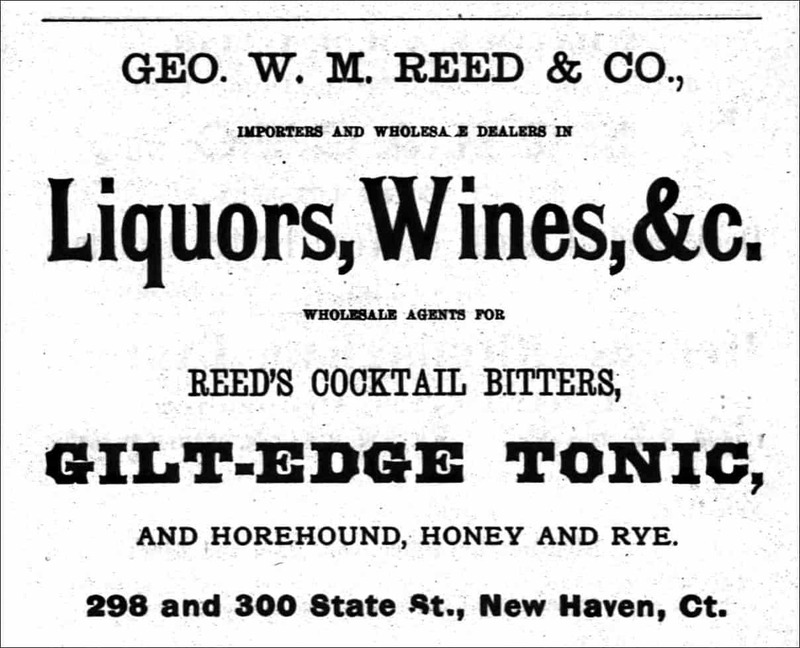 W. Reed Bitter Co., New Haven, Conn. in the 1870s. 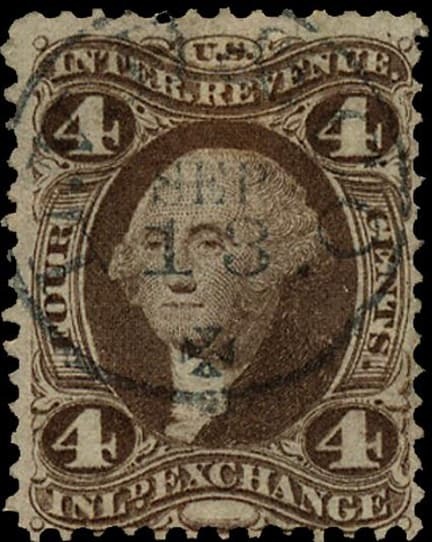 From and after January 1, 1874 each bottle had a 4 cent Internal Revenue Proprietary Stamp (see below). 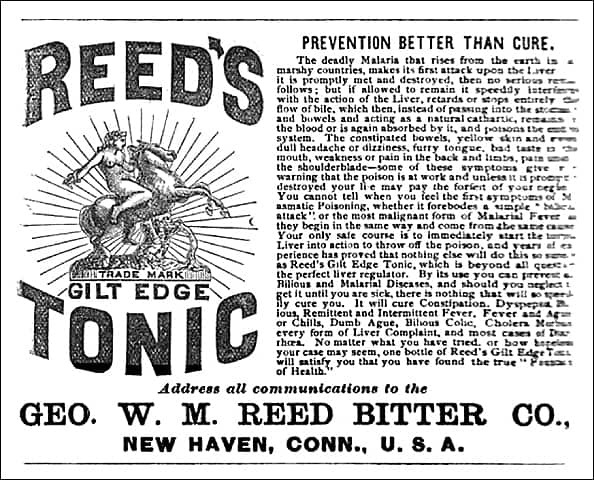 Not much personal information is available for George W. M. Reed from New Haven, Connecticut but he sure put out a rather well-known bitters, that being Reed’s Bitters, which later morphs into Reed’s Cocktail Bitters, Reed’s Aromatic Bitters and Reed’s Aromatic Stomach Bitters. 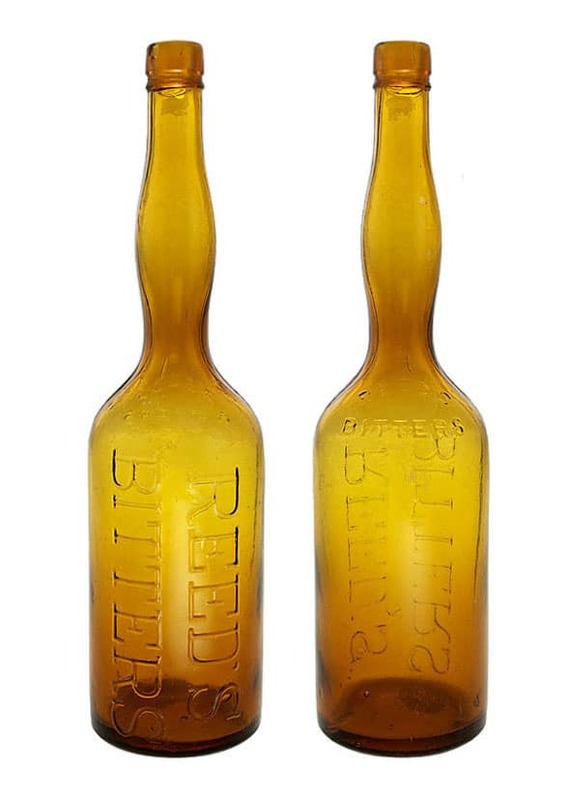 Essentially the same bitters put up in beautiful amber lady’s leg figural bottles. 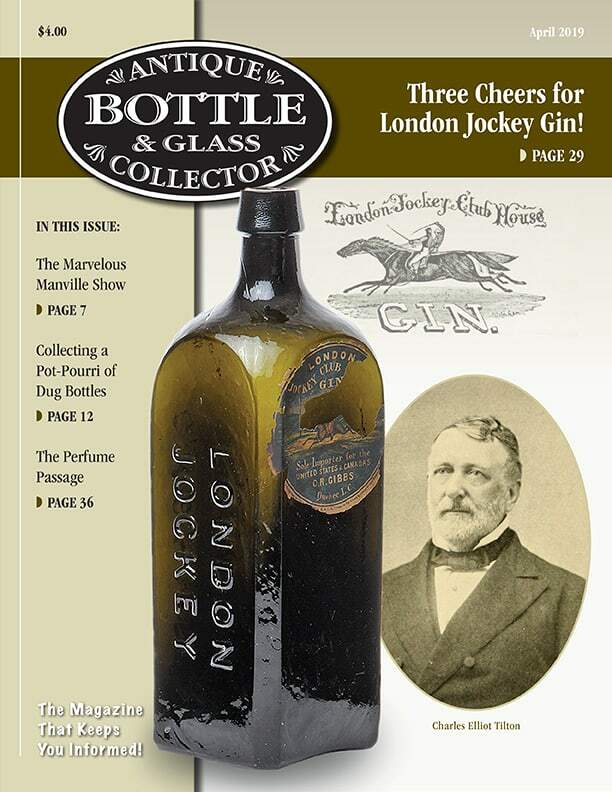 He was also known for his Reed’s Gilt-Edge Tonic (also advertised as Reed’s Gilt-Edge Tonic Bitters). 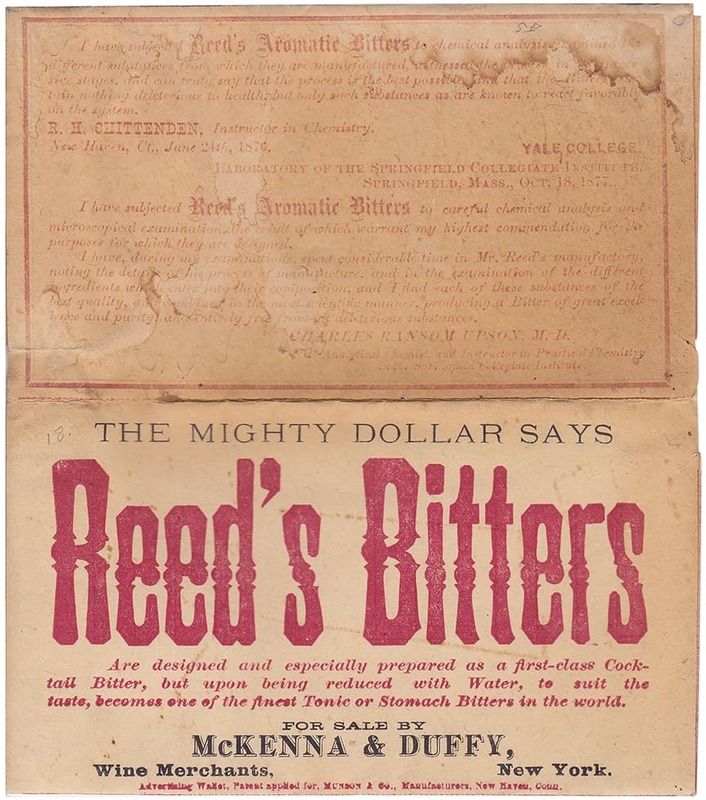 Reed advertised extensively and sold his product nationally, often making trips with his top salesman to pitch the bitters, so we can track him that way. 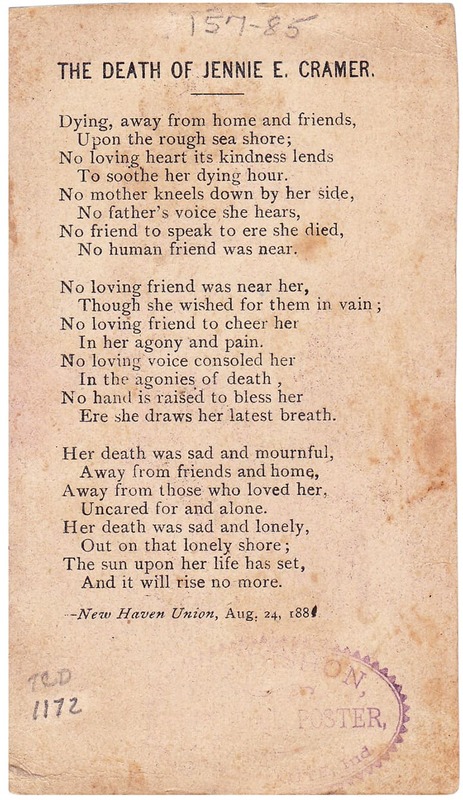 George W. M. Reed was born about 1842 in Connecticut. Both of his parents were also from Connecticut according to an 1880 United States Federal Census. We first see him listed as Tuttle & Reed, liquors & ales at 176 State Street in New Haven. Nathan Hale Tuttle was his partner. 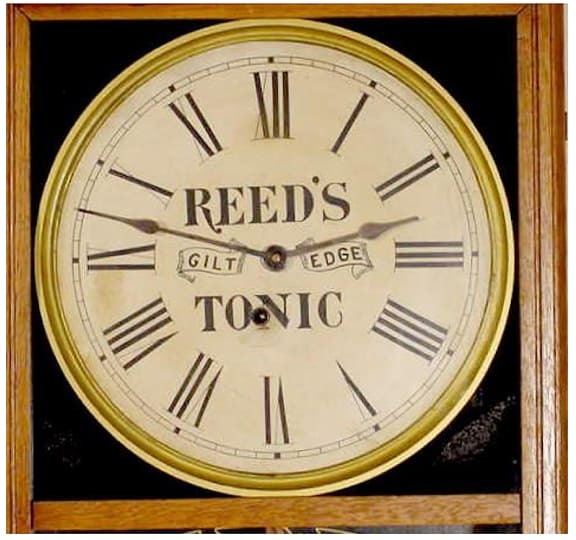 Reed probably clerked in this or another liquor store first to get some experience. In 1871, he is listed as Reed & Moseley, liquor dealers, 176 State Street. 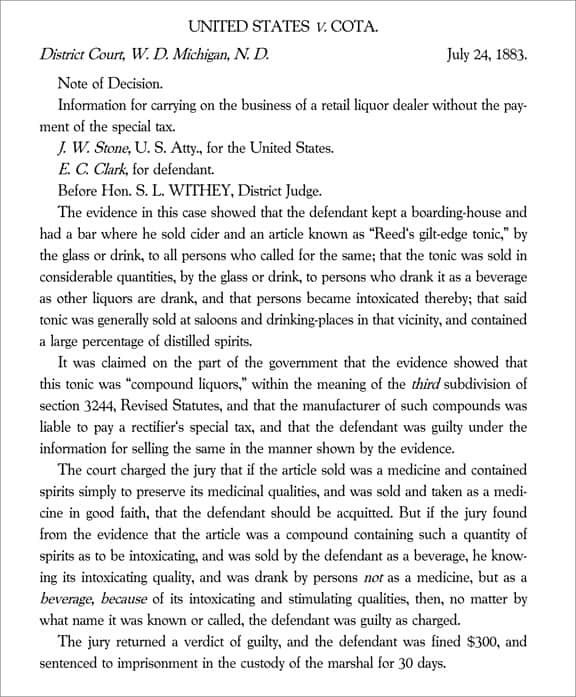 In 1873, the concern is now G. W. M. Reed & Co., liquor dealers at the same address. 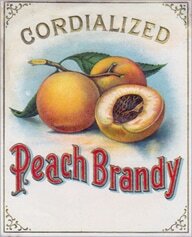 In 1874, the name is George W. M. Reed & Co., and W. O. Fletcher is his partner. 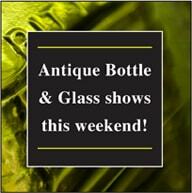 They are selling ales, wines & liquors at 176 State Street. 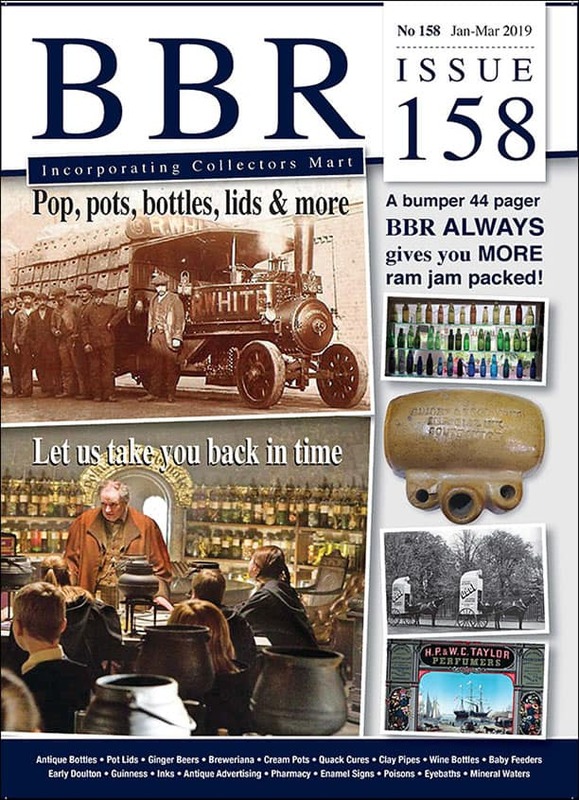 We first see mention of Reed’s Bitters in 1875 when a New Haven directory listing notes Geo. 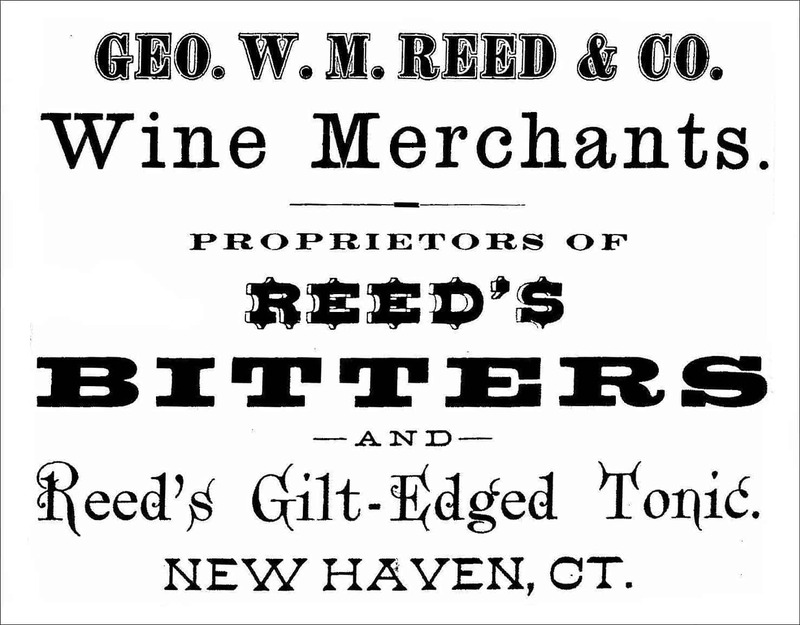 W. M. Reed & Co., wine merchants, Manufacturers of Reed’s Bitters, 176 State Street. 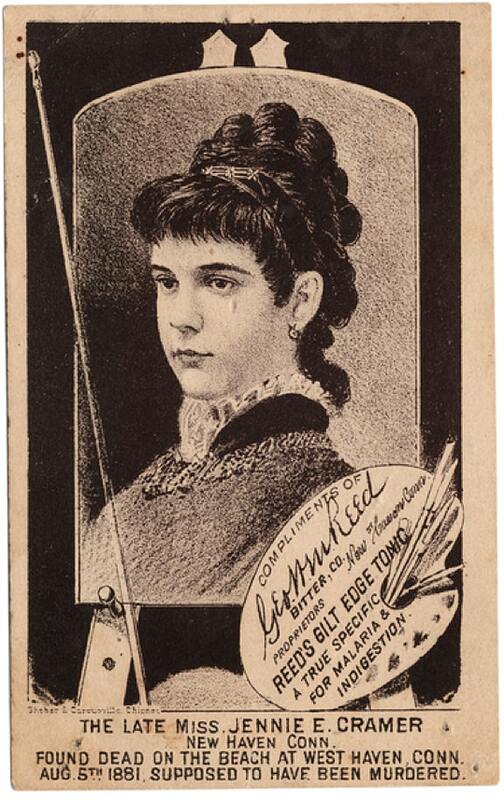 He was proud of his bitters and indicates on one of the advertising trade cards below that his bitters had won some international gold metals though I can find no record of this. Those metals have the dates 1862 and 1867. 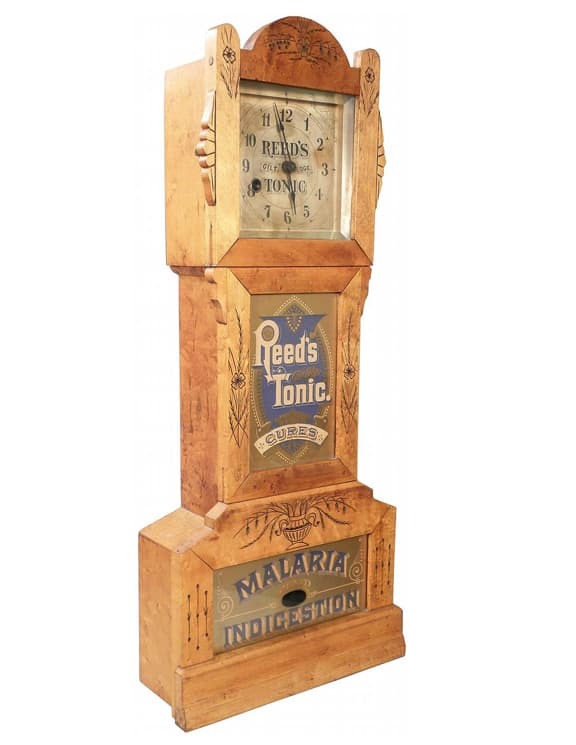 He could have concocted his bitters then but he certainly wasn’t advertising it yet. He probably just added the dates to give his product some history. His lady’s leg bitters labels probably read, “Reed’s Aromatic Stomach Bitters” and his bottles were simply embossed “Reed’s Bitters.” I have not seen any labeled examples except in the illustration on the trade card below. On the Reed’s Bitters wallet card below, you will see advice on how to make his first-class Cocktail Bitters and when reduced with water, his Stomach Bitters. Just changing with the times and market trends. 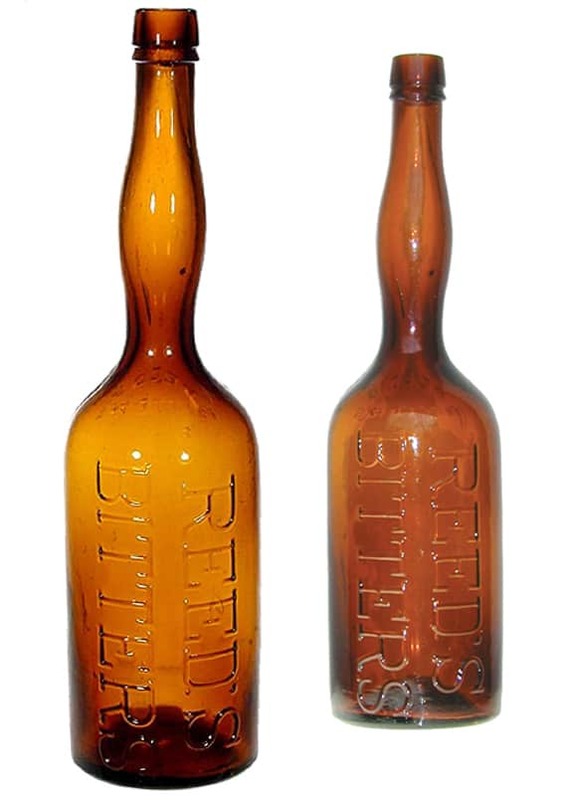 From 1878-1881, Daniel O. Reed joins him and they are listed as Bitters Manufacturers at 298 State Street in New Haven. 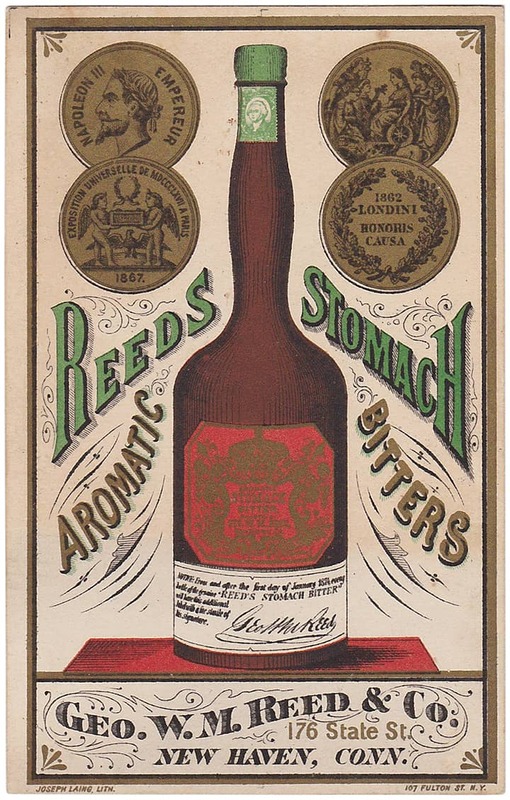 We first see Reed’s Aromatic Stomach Bitters listed in an Internal Revenue Record in 1879. 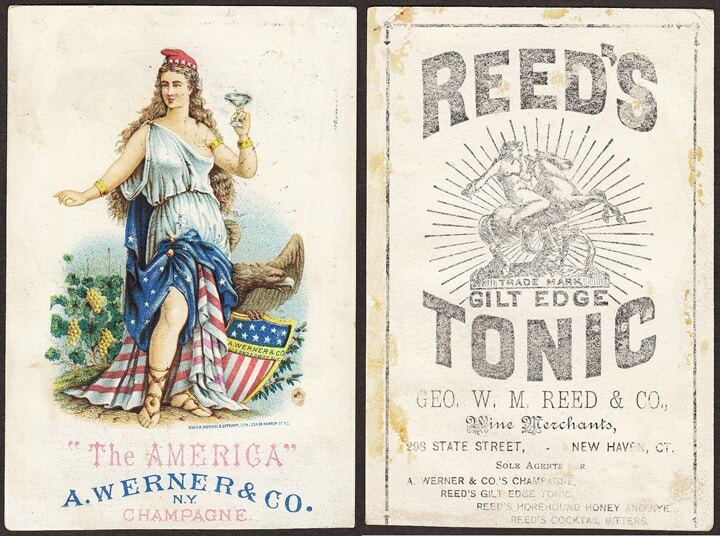 By 1881 and 1882, we see advertisements for both Reed’s Gilt-Edge Tonic and Reed’s Cocktail Bitters. Reed has changed his company name to Geo. 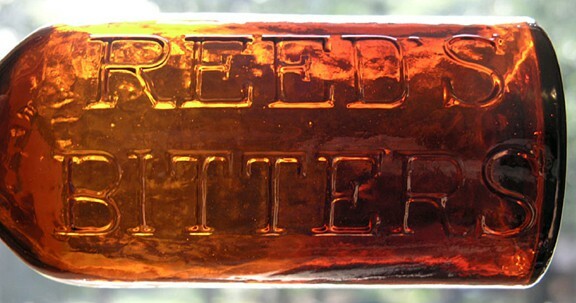 W. M. Reed Bitter (no “s”) Company. 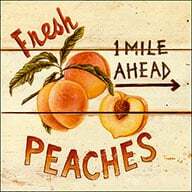 He is also listed as importers and wholesale dealers in liquors, wines, &c., and notes a new product called Reed’s Horehound, Honey & Rye. 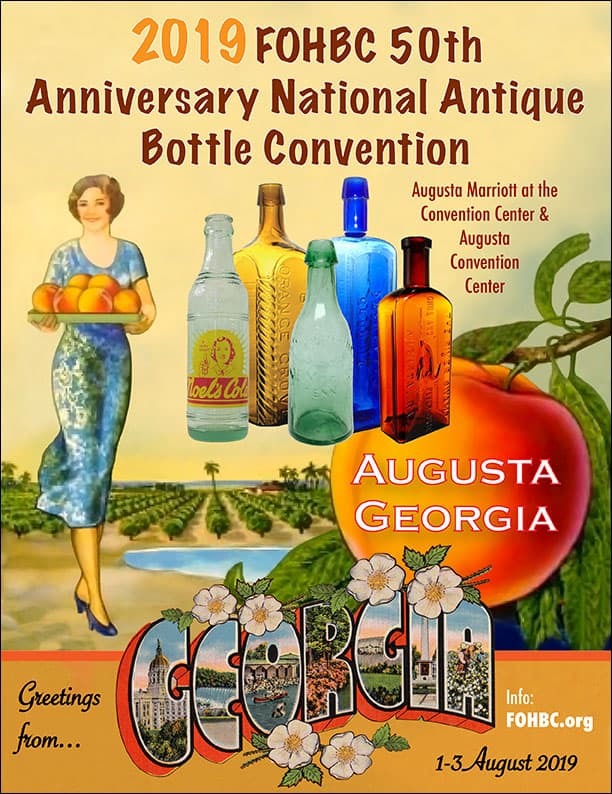 The last listing I can find is The George W. M. Reed Bitter Co. in 1894. What happens to George W. M. Reed after that is unknown. 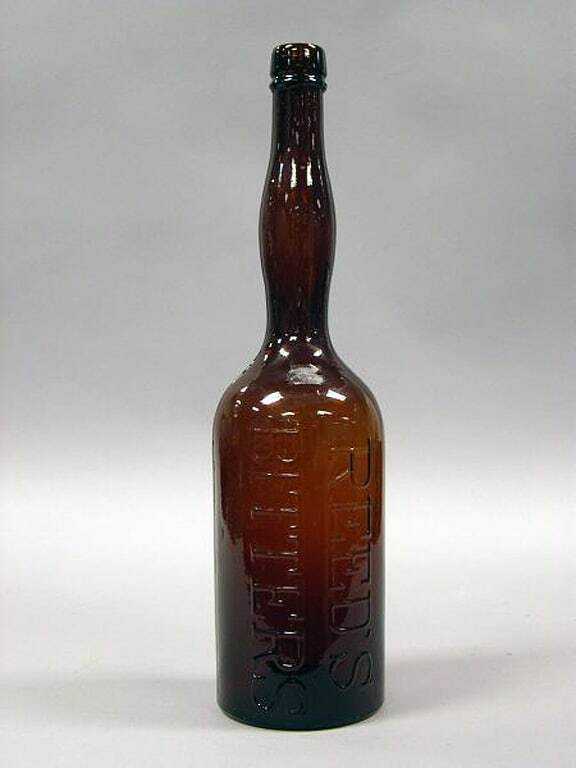 This entry was posted in Advertising, Bitters, Digging and Finding, Ephemera, History, Liquor Merchant, Miniatures, Questions, Tonics, Trade Cards and tagged bitters, clock, cocktail, Connecticut, Cure, Edge, George W. M. Reed, Gilt, horehound, Joe Gourd, lady's leg, liquor, Medicine, merchant, New Haven, New York, Plainfield, Reed's, Stomach, Tonic, Vermont, vial, Wine. Bookmark the permalink.